What’s really going on in gentrifying neighborhoods? Yesterday, we wrote about the Chelsea neighborhood in Manhattan, which is in the unique position of being one of the wealthiest urban communities in the nation, and also having almost a third of its housing be public or otherwise subsidized. The question was, what happens to the residents of public housing in a place like Chelsea when it gentrifies? The answer was mixed, but mostly positive. A study from the well-respected Furman Institute at NYU showed that residents of public housing in wealthy or “increasing income” neighborhoods earned substantially more, on average, than public housing residents in low-income neighborhoods. Moreover, they experienced less violent crime and their children went to better public schools—and, likely as a result, did better in school themselves. While low income residents of gentrifying neighborhoods cited problems finding affordable local retail and a sense of alienation from the businesses and institutions catering to their very different neighbors, on balance, many thought their neighborhoods had changed for the better. But New York City is unique in having such huge concentrations of public and subsidized housing in many affluent or “increasing income” neighborhoods. In most places, low-income residents in low-income communities live in market rate housing that’s affordable because there is so little demand for it from middle class and upper-income households. In those cases, you would expect that as demand increases, those residents would be priced out, excluding them from the benefits of an increasingly resource-rich community. Second, the Philadelphia Fed joins the Furman Center in finding that those residents who remain in gentrifying communities see some economic gain. In this case, the authors measure financial health through credit scores. Remaining in a gentrifying neighborhood is worth, on average, a gain of 11 credit score points over three years, compared to a situation in which the resident’s neighborhood did not see rising income and rent levels. It’s not entirely clear why this happens, but rising income (as suggested in the Furman report), or improved access to credit, might be a part of it. 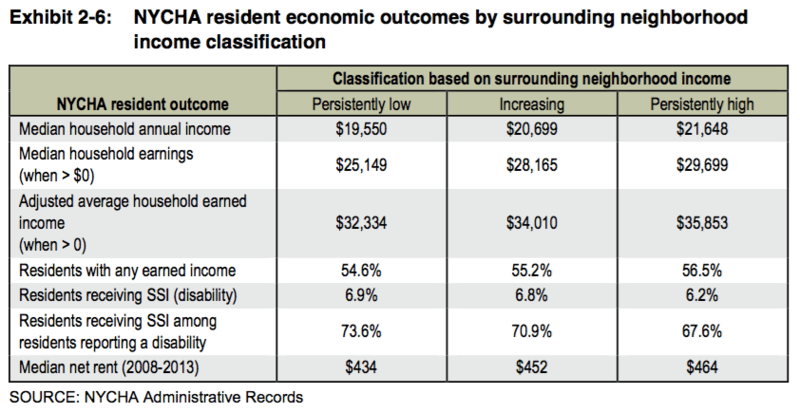 Complicating those results, residents with particularly bad credit saw relatively larger increases in their scores, though living in a gentrifying neighborhood was associated with slightly smaller increases than if they had lived in a nongentrifying area. 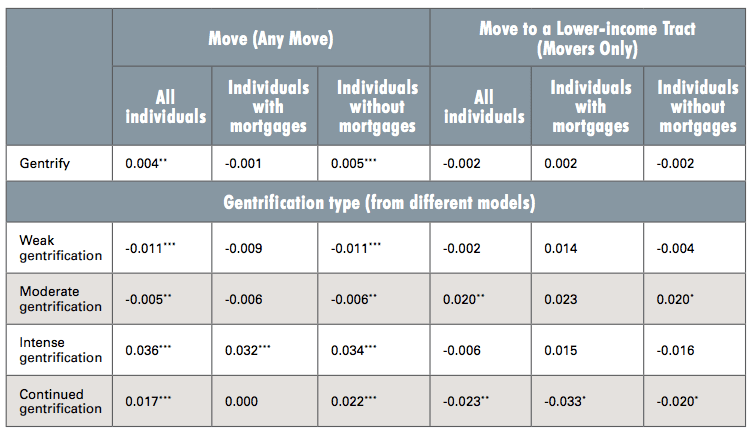 Finally, while many narratives about gentrification suggest that the choice is between neighborhood change versus stability, that is not what the Fed study depicts. While the average gentrifying neighborhood in Philadelphia saw its median income increase by nearly 42 percent between 2000 and 2013, nongentrifying neighborhoods did not remain the same—their median income fell by almost 20 percent, with an almost five percentage point increase in the poverty rate. Moreover, while gentrifying neighborhoods’ population grew by an average of 2.3 percent, nongentrifying neighborhoods lost nearly two percent of their population, driven not only by an exodus of non-Hispanic whites, but also a decline of almost five percent in the population of non-Hispanic blacks. Perhaps most amazingly, the proportion of residents who were housing-cost-burdened increased by over 10 percentage points in neighborhoods that didn’t gentrify—probably because of falling incomes. “Lost in Place” found that neighborhoods that remained poor lost about 40 percent of their population from 1970 to 2010. The point here is not that everything in gentrifying neighborhoods is peachy. After all, there’s very little displacement of economically vulnerable people in exclusionary high-income neighborhoods, because there are no economically vulnerable people to begin with. But when there are problems, they’re less likely to be existing residents forced out by rising rents, and more likely to be potential residents who are turned away before they even arrive. The challenge, in neighborhoods that are becoming more affluent as well as ones that already are, is to make sure that there is a sufficient stock of affordable housing (both subsidized and “naturally occurring” at market rate) to accommodate people of whatever means who want to move in. The best way to do that remains to make sure there isn’t an overall shortage of housing, and that there’s a variety of housing types, from single family homes to apartments of various sizes; and to remain friendly to developers of subsidized housing and people holding housing vouchers. But the fact that rigorous studies of neighborhood change consistently produce results that, at least, complicate widely repeated narratives about gentrification ought to give us pause. While there are certainly people who are forced out of their homes by rising rents, it’s curious that the focus on those cases tends to crowd out attention on people who would like to move to a neighborhood but can’t afford it, a situation that appears to be more widespread. Similarly, the implicit assumption of most gentrification coverage—that the absence of gentrification would result in the preservation of the existing neighborhood as is—clearly needs to be reassessed. We’ll write more about this media issue tomorrow.